YORK - The Dow is still 4.3% below its March high of 11,027, while the S&P 500 Index and Nasdaq both hit four-year highs in the past two weeks but have fallen back 1.9% and 3.3%, respectively. The S&P hit a high of 1,245.86 on Aug. 3, and on the same day the Nasdaq got up to 2,219.91. There�s nothing wrong with hitting new multiyear highs, but when a stock or index follows up on a new high by closing lower for the week, that�s a very bearish sign. Michael Burke, editor of Investors Intelligence, has a term for what the Nasdaq and S&P 500 did two weeks ago: He calls it a buying climax. 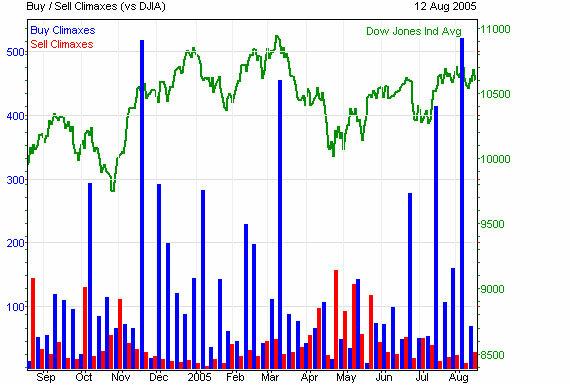 "Buying climaxes occur when a stock makes a 12-month high but closes the week with a loss," says Burke. "They are a sign of distribution and indicate that stocks are moving from strong hands to weak ones." It is very possible that the summer rally has ended and corrective action is near," says Burke, adding, "September is the only month with a historical record of losses, and we have also seen a number of good-sized drops in October. Short-term indicators have moved to sell signals." The opposite of a buying climax is a selling climax, which is a bullish sign that a stock has bottomed. �Our work shows that sellers into buying climaxes and buyers into selling climaxes are right about 80% of the time after four months," Burke says. A glance at the chart below shows that spikes in selling climaxes tend to precede market rebounds, while a sharp rise in buying climaxes precedes market drops. So while the momentum in the broad market appears to be slipping, there may be some opportunities among last week�s 27 selling climaxes identified by Investors Intelligence. We selected from two of the better-performing indices, the S&P MidCap 400 and the S&P SmallCap 600. Among mid-caps, laboratory testing company Beckman Coulter (nyse: BEC ) is up more than 3.5% from its 52-week low last Aug. 15 of $52.25. Also, digital rights management company Macrovision (nasdaq: MVSN) has fallen nearly 20% in August, but so far has successfully bounced off of a $17.51 Aug. 11 low. Ryan�s Restaurant Group (nasdaq: RYAN) is a small-cap that bottomed out on Aug. 9 at $12.13 and has so far not breached the low. Another small-cap, Daktronics (nasdaq: DAKT), which makes electronic scoreboards and large signs, hit a 52-week low of $19.20 on Aug. 8 and is up 6.5% off of the low. On Aug. 10, Richmond, Va., plastic and aluminum supplier Tredegar (nyse: TG) traded as low as $12.92, but within four days had risen 6.1% to $13.72.